A 2014 study (Rowson S, Duma SM et al) by researchers at Virginia Tech - Wake Forest and six other leading universities has found that the risk of sustaining a concussion for players wearing a helmet with a newer design (the Riddell Revolution) was 46.1% lower than for players wearing a helmet with a 20-year-old design, the Riddell VSR4. Question: What is the significance of the fact that the STAR helmet rating system predicted that a Riddell Revolution would result in a 54% reduction in risk of concussion compared to the Riddell VSR4 and that the predicted risk reduction was almost identical to the percentage reduction reported in your study? Is it mere coincidence, or does it provide the kind of validation for the usefulness of the STAR system as a surrogate for real-world conditions that makes the STAR ratings of even greater value for parents, and those purchasing football helmets? Duma: We think that this is excellent validation of the overall system. We would never have guessed the risk reduction would have matched so closely. Yes, in our opinion this makes the overall STAR ratings very useful. 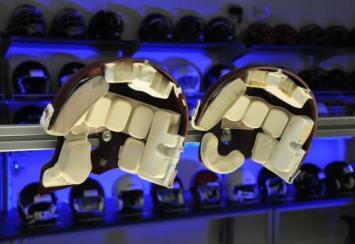 Question: Does it blunt or rebut completely NOCSAE's criticism that you failed to test helmets under game conditions? Duma: Like most consumers, we have moved past NOCSAE's criticisms. Like any scientific analysis, there are limitations to our research, nothing is ever 100% perfect. However, our data show that some helmets are better than others at reducing head acceleration, and that reduces the risk of concussion. Question: Can your findings on the Revolution and VSR4 be extrapolated in any meaningful way to draw conclusions about the relative ability of other helmets to reduce concussion risk? Duma: Yes, the basic finding is the reducing head acceleration reduces risk. Any helmet that reduces head acceleration will reduce risk. Question: To what do you attribute the difference in risk reduction reported in your 2012 response to Dr. King in the Annals of Biomechanical Engineering? (Rowson S, Duma SM. 2012). Other than the fact that the current study involves a much larger cohort (1833 players versus 308 players), where there other differences in methodology that can account for the differences? Are they statistically significant? Duma: It is a much larger study overall. The only difference would be that now you have 8 different people diagnosing concussions, given the 8 schools. That is a variable that likely mattered most. Question: Is controlling for the number of head impacts each player experienced the key change in study design that allows you to say with confidence that the current study is the first to show that helmet design matters, and can reduce concussion risk in football, or was it just as important that you also controlled for other potential confounding factors, such as consistency of medical care (same team doctor making each of the concussion diagnosis)? Duma: That is the key change, controlling for exposure is the only way to do this accurately. Also, we were dealing with only new helmets, as each player gets a new helmet, or new helmets in their college career. Question: Can you explain why the number of head impacts experienced by instrumented players provides more valuable information relating to helmet design than the total number of players or athletic exposures? I write for a largely non-scientific audience so I want to be able to explain it in terms they will understand. Duma: It allows you to control the study, so you do not have to worry about comparing starters versus second string players, or kickers compared to linebackers. For example, if you gave helmet A to the starters and helmet B to the second string, that is not a good study. That is the key limitation of the other studies is that you do not know what the exposure is. A parallel analysis can be seen in the medical field. For example, cancer indicators like smoking, or asbestos, or lead paint. Did you smoke one cigarette a day or two packs a day? Did you work in an asbestos factory or just pass through a building once a month that has asbestos? Did your child eat lead paint from the wall, or just live in a house for a few months that had lead paint? You have to know the exposure before you can draw accurate conclusions. Question: Is the failure to control for the number of head impacts per player perhaps the reason why McGuine, et al. found in the paper presented last year to the AOSSM (McGuine T, Brooks A, Hetzel S, Rasmussen J, McCrea M. "The Association of the Type of Football Helmet and Mouth Guard With the Incidence of Sport-Related Concussion in High School Football Players." Presentation Paper AOSSM, July 13, 2013) that the risk of sustaining a concussion in high school football was not affected by the brand or age of the helmet worn? Duma: I have not seen that full study. Your reference is only to an abstract, that has gotten a great deal of attention, but the full data set has not been published yet. So, I do not know what their numbers are. Of course, not accounting for exposure makes it very difficult to draw conclusions. Question:	As a result, is it fair to say that the type of helmet worn does matter, and that it is critically important that football players wear helmets employing the best technology available (thicker foam, greater offset), proof of which, as you noted in a  email to Dustin Fink, was the improved rating of the Xenith X2 from 3 stars to 5 stars because of significant design changes, including much more padding? Duma: Yes, the helmet does matter, and we recommend parents get any 4 or 5 star rated helmet. In general, they have more padding, and optimized designs, to lower head acceleration. But note, no helmet will prevent all concussions, and there is always risk. Question:	What, if anything, do the results of your study say, even directionally, about reduction in concussion risk for youth football players? Duma: There are many questions left to be answered regarding youth helmets. In a general sense, lower head acceleration is better. I think that everyone would agree to that statement. However, we still have much research to perform on the youth population. Question: A lot has been written in the last couple of years, all essentially saying the same thing: that there is "no good clinical evidence that currently available protective equipment will prevent concussions. Is it fair to say that now there is good clinical evidence that helmet design, while it may never prevent all concussions from occurring in football, can reduce the incidence of this injury? Duma: Yes, now there is solid clinical evidence. This is a very large study, 8 universities, 15 authors, this is very sound science. Question: With the massive amount of data you have now collected, I assume you and your team will be using it as a basis for additional studies. Do you plan to use it to try to establish an impact threshold for concussion? Duma: There will never be a pure threshold. There is no threshold for anything in life. Iet is always about risk. Think back to the medical examples. There is no threshold for the number of cigarettes that causes cancer, more is worse, less is better, but everyone has a different risk. I may smoke once and get cancer, others can smoke packs a day and maybe not get cancer, but they have a higher risk. Injury is the same analysis, for all body parts, femur fractures, rib fractures, brain injury, we all have slightly different tolerances, and therefore it is best to talk in terms of risk. A certain acceleration carries with it a certain risk of concussion. We can decide what level is acceptable and set the acceleration value. For example, a 5-star car translates to a car that performs with a 10% or less chance of serious injury.